To provide young scientists with a global understanding of the Sun-climate connection and facilitate the multidisciplinary interaction between young scientists worldwide, a training school entitled Impact of Solar Variability on the Earth’s Climate was held in Thessaloniki, Greece, under the auspices of Cooperation in Science and Technology (COST). As the only participant came from China, Dr. ZHAO Xinhua from National Space Science Center (NSSC), under Chinese Academy of Sciences was invited to attend the training school after a highly competitive selection process. The timely yet controversial topic of solar variability on global climate change is of major scientific and social importance, but due to the lack of interactions between different communities all over the world, researches in this multidisciplinary field are progressing at a low pace. Dr. ZHAO from the State Key Laboratory of Space Weather, NSSC, presented a poster entitled Happening Rates of CME-ICMEs and Their Possible Influences on the Averaged Global Temperature. The poster compared the variations of solar activity such as sunspot number and total solar irradiance to the changes of global average temperature; it also focused on correlations between the rates of CME-ICMEs and the global temperature changes. The one-week training school from Mar. 10 to Mar. 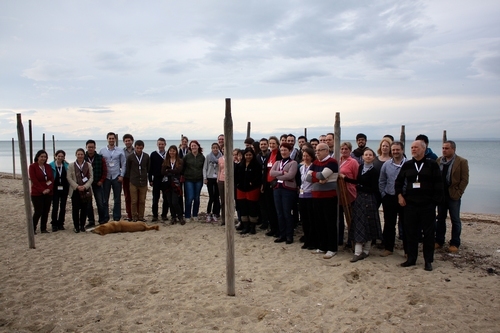 15 had all-together selected 25 participants worldwide and all lecturers in this training school are scientists actively involved in the COST action called Towards a More Complete Assessment of the Impact of Solar Variability on Climate (TOSCA). As a multidisciplinary European network of scientists from more than 18 countries, TOSCA action aims at assessing the various impacts of solar variability on the Earth’s climate through joint efforts of solar physicists, space scientists, plasma physicists, atmospheric scientists and climate modelers, etc. The lectures cover topics such as solar dynamo, solar wind, space weather and space environment, atmosphere physics, physics and chemistry of the stratosphere and the mesosphere, climate impacts of solar activity and so on. For more information on sun-climate school: Impact of Solar Variability on the Earth’s Climate, Please Click: http://sun2climate.sciencesconf.org.